The PMI stands for Purchasers Managers Index. The research firm Markit surveys managers of private companies and asks questions about five different topics. These topics are New orders, Output, Employment, Suppliers' delivery times and Stocks of purchases. When the index is at 50 there is no change. Anything below 50 means a decline in activity; similarly above 50 means an increase. This picture shows the data for April 2012. 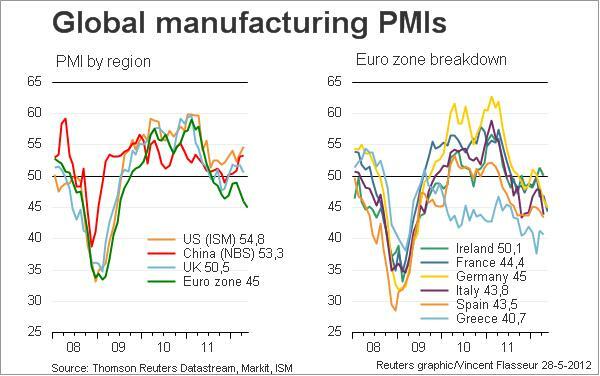 The PMI of the Euro Zone is declining more and more. Especially Greece, Spain and Italy are not doing well. Germany and France have joined them in recent months.